This post was written for ISTE’s Blog on 4/17/2018. To be successful learners, students need to be proficient readers. Our classrooms are filled with a broad spectrum of readers: some are advanced, some struggle, some are English language learners and others are reluctant readers. And there may be other types of readers you can identify in your classroom. As a result, teaching is not “one size fits most.” We need a variety of approaches — and for a variety of mediums. Teachers must not only address functional literacy, which includes reading of visual, print and digital text, but also encourage students to be critical consumers of information and effectively communicate their thinking about these texts. Technology has allowed teachers to diversify their teaching and provides leverage for all students to succeed. More important than the technology tools you use, however, is that you create meaningful classroom experiences to promote reading, critical thinking and digital literacy. HyperDocs and playlists. Similar to a Google Doc, these digital documents allow you to pull together learning resources in one place. The document contains hyperlinks to all aspects of the inquiry unit — videos, slideshows, images and activities for students to complete and gain understanding. Students have multi-modal opportunities for learning, and there is less teacher lecturing at the front of the class. HyperDocs allow students to work at their own pace and offer a road map for student learning. Depending on the HyperDoc the teacher makes, differentiated activities and technology-rich assignments can help students learn and show their understanding while completing the activities included on the HyperDoc. Teachers might have students complete only a certain number activities on the HyperDoc or require students to do them all. Through differentiation and choice, you can provide alternative ways for students to learn and show what they know. Choice menu boards are a great way to do this and, once again, technology can help. You can create choice activities for before, during and after reading to highlight reading strategies, content understanding and multiple intelligences. Whether in the form of a Bingo board or a Think-Tac-Toe, choice in the classroom empowers students, while at the same time adheres to learning goals. When students are able to select choices that most appeal to them and that they’re comfortable completing, they can master the activity and move on to more challenging activities. Quest-based learning adventures (and gamification). This approach to learning connects game mechanics with content objectives to promote learning and deepen student understanding. Through gamification, you can transform literacy instruction into a game with creativity, collaboration and play while still meeting Common Core State Standards and ISTE Standards for Students. Exactly how you bring games and game playing into the classroom is really a matter of thinking creatively and playfully about what you already do. For example, you could tie assignments to point values and badges that students could then use to unlock privileges, such as a homework pass or preferential seating. As with choice menus, students would choose which assignments to complete and when, but with the aim of collecting as many points as possible or a “literacy champion” selection of badges. Alternately, you could organize an overarching mission in which assignments are like a sequence of game levels. Students would need to successfully complete each assignment in order to “rank up” to the next and eventually complete all the required material. Digital reading platforms. Actively Learn and Newsela are just two platforms that offer accessible text that you can use to build comprehension and conversations in the classroom. Both are available free for teachers and students, or you can upgrade to the subscription-based pro versions. In both versions, teachers can embed quizzes, annotations and writing prompts with every reading. The pro edition adds such features as the ability to view individual student progress, track student progress against the Common Core State Standards, and for students and teachers to see each other’s article annotations. Actively Learn allows teachers to upload their own material to the platform. Customizing assignments with a digital platform leads to more effective and independent instruction that targets students’ strengths and weaknesses by giving support to students who need it, while omitting it for those who don’t. You can use Actively Learn, Newsela and other reading platforms in a variety of ways to support diverse readers and build content knowledge with jigsaws, do nows and flipped learning. Once teachers get to know their students, they can incorporate meaningful and thoughtful learning experiences for all learners. Classrooms are made up of diverse readers, all with different abilities. As teachers, we need to be aware of our students’ strengths and weaknesses and create interactive lessons that meet the needs of all the learners in our classroom. Through differentiation and scaffolding, teachers can personalize learning while simultaneously building reading skills. There are dozens of tools out there to help teach literacy skills and show students how to be, as described in the ISTE Standards for Students, Knowledge Constructors and Empowered Learners. The challenge for teachers is finding the right tools to help personalize lessons specific to their grade level and content area, while at the same time supporting the diverse learners in their classrooms. This digital reading platform offers a catalog of articles and texts suitable for elementary and secondary students. You can assign texts for your students to read as well as embed questions, polls and writing assessments throughout the reading. You can also embed media and hyperlinks in the text to help guide student reading and thinking. Another benefit of Actively Learn is that it offers not only pre-made reading lessons with questions aligned to cited Common Core State Standards, but also the ability to upload your own text and create customized reading assignments for students. If a student doesn’t know the meaning of a word, right-clicking on the word brings up a menu where the student can choose to see a definition, translate the word or hear the word read aloud. Because Actively Learn lets students translate the text into different languages or hear it read aloud, ELL students can read in their native languages and struggling students get help with text comprehension. Customizing assignments with a digital platform like Actively Learn leads to more effective and independent instruction that targets students’ strengths and weaknesses by giving support to students that need it, while omitting it for those who don’t. With a focus on nonfiction articles, this reading platform offers content on an array of subjects (current events, history, science, literature and more) and at multiple Lexile reading levels. Newsela enables you to search thousands of articles and text sets that are collections of articles on a common topic, theme or reading standard. To make it easier for you to share the same article with the variety of learners in your classroom, Newsela adapts its articles to several Lexile levels, so you can assign the same article to your whole class and still offer personalized reading. No matter what their reading proficiency, students can all work on the same article and be contributing members of the classroom, but each can work at his or her prescribed level without being frustrated or bored. Newsela embeds quizzes, annotations and writing prompts with every reading. 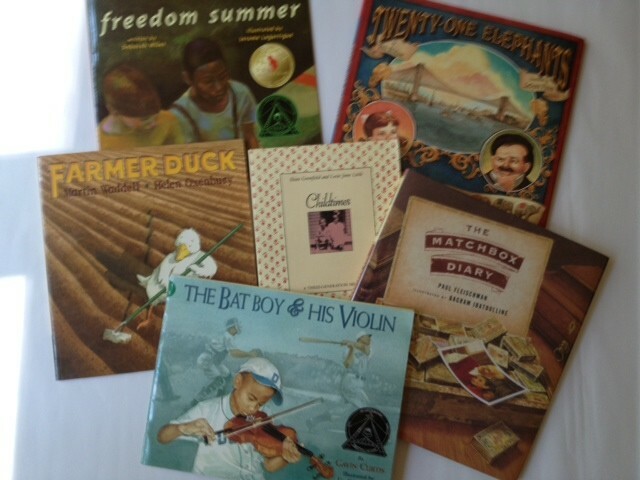 The text sets are excellent for jigsaw activities and examining multiple perspectives. This interactive presentation tool allows teachers to incorporate reading, questioning, viewing, polls, drawing and even virtual reality. It offers a library of interactive lessons on topics across content areas and grade levels. You can use Nearpod as a presentation tool for an entire class or personalize a lesson or strategy session for individual and small groups of students. Using a platform like Nearpod allows students to work at their own pace and demonstrate their learning and understanding. With the different types of interactive response tools, teachers can support different learning preferences. While Nearpod offers both teacher-created lessons and the ability for teachers to design their own lessons, Buncee offers templates and blank slides for teachers to customize to design an interactive and engaging lesson. Using the graphics, video, audio and texts, teachers (and even students) can create engaging blended learning experiences. The premium version allows for quizzing in Buncee assignments and 360 images. This post was written for ISTE’s Blog on 3/30/18 and you can read the complete article here. This year I implemented socratic seminar into my classroom to encourage close reading. The trial scene in To Kill A Mockingbird is a perfect place to encourage discussion and deep reading. Prior to the seminar, students were to prepare a “One Pager” – A one pager is a single-page response to reading. Some might say that the purpose of a one pager is for students to own their reading and showcase their understanding with images and words. Choose three or more meaningful quotes from the reading: passages/quotes that relate to the theme or main idea of the story. Be sure to use quotation marks, and include the page number where you found the quote. Provide a thought provoking explanation of the importance and meaning of the quote: (how does it help you, the reader, get a better understanding of the story, character, theme, etc.). Use graphic representations: a drawing, magazine pictures, or computer graphics that go with the piece you read, and the quotes you chose. Include a personal response to what you have read: this is NOT a summary of the story. This is a thoughtful, insightful response. Think about the message the author is trying to get across, how the author uses different types of literary devices (suspense, mood, point-of-view) to make the story more interesting. This response must be a paragraph minimum, with specific examples from the story.  It MUST be on a standard sized (81⁄2 x 11) unlined sheet of paper.  Writing MUST be in ink or typed…no pencil.  The title and author of the story (correctly formatted) MUST appear somewhere on the front of the paper.  Reference the page number in parentheses after each excerpt. To help guide my students’ analysis of the trial scene in Mockingbird, I included eight (8) questions on the back of the one-pager assignment and suggested that students answer three (3) questions regarding the trial and to answer with direct textual support. The questions addressed how likely is it that Tom Robinson committed the crime of which he is accused, Mayella Ewell’s attitude about race, the response the children had to the trial, who is the mockingbird, was Atticus successful during the trial, and Atticus’ character displayed during and after the trial. For students not sure which quotes to pull from the text, these questions helped students hone in on some key ideas. In addition, they were the jumping off points for our Socratic Seminar. The one pager assignment was completed in class and then if extra time was needed, students could work on it outside of class. The quality of the one-pagers I received from 95% of my students was exceptional and helped to carry out a robust Socratic Seminar. The procedure for the Socratic Seminar included moving all the desks into a large circle for all the participants to see each other. Students put all books away and only had their one-pagers out in front of them with the text. I reminded my students that this is a conversation and not a debate, rather it is a chance to uncover deeper meanings about the author’s central ideas within the text and communicate our interpretations with the class. I told students that there are no right or wrong answers. In even posted discussion stems on the SMARTBoard to help students frame their conversations and support one another throughout the discussion. While students were speaking, I kept track of who spoke and contributed to the discussion in meaningful ways. I told students that in order to earn points during the discussion they had to speak at least three times and build on another’s point using specific examples. I told students that I won’t call on them to speak, they are to jump into the conversation and say something to receive full credit for the discussion. In one class, students spoke around the first question for more than twenty minutes. I have to give credit to my amazing co-teacher for introducing me to both the one-pager and encouraging me to do a Socratic Seminar with my students. It was such a success that I wish I had done these activities earlier in the school year and conducted the seminar more often. This is something that I will implement with all the units that students read and write in the new school year. For more than two years that I have infused gamification elements into my English Language Arts classroom to improve engagement, community, and learning. This upcoming Wednesday, April 19th I will be presenting a Webinar for Classcraft Games on using gamification in English. As a Classcraft user, I will address how I use Classcraft Games in my classroom, plus share additional add on games I have created over the past few years to teach concepts related to reading, writing, and critical thinking. Classcraft fits seamlessly into any content area classroom and I use the gaming platform as a way for students to track game points earned throughout the school year. Within the Classcraft platform additional gaming elements such as a random student generator, boss battles, and daily events inspire more gaming variety. Classcraft encourages teamwork and motivates many of my students to go beyond simple classwork. For example, each month I moderate Twitter Book Chats and students can earn 1,000 XP (Experience Points) for reading the book and participating in the chat. This is a win win for the students because they are reading new books, talking with others about their reading, and earning games points that can unlock additional powers and privileges. Privileges include preferential seating, previewing quiz questions, and even a free homework pass. In addition to utilizing Classcraft, I am always building new games and add ons with each unit of study. This year I used bottle flipping on a target board for specific writing prompts. After learning about the “old school” Nickelodeon show Legends of the Hidden Temple, I created my own version of the game for a reading unit on courage. I am always transforming traditional board games like Bingo, Connect Four, and Snakes and Ladders into theme based games for classroom learning. Join me for a discussion of gamification to promote reading, writing, and critical thinking. Register for the Webinar here. Preview the slide deck below. When we read for school and academic purposes we have to read differently than when we are reading for pleasure. When we read for school we know there is going to be an assessment of our reading during and after reading. That assessment can be a reading comprehension quiz, an essay or short response, even a project to show your understanding. We tell our students to read closely? But what does that really mean for middle school students to close read? I tell my students to think of an onion. There are many layers to an onion and similarly, there layers to the text we must uncover. How does the text work? What does the text mean? 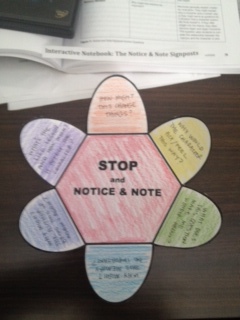 I created an interactive foldable to help reiterate close reading and the layers of reading or “ways of seeing” a text. This foldable offers students a visual and guiding questions reminding them of what is expected of them when reading in middle and high school. The layers of close reading on the foldable are based on Fisher and Frey’s TDQs: Text Dependent Questions (2016) which I describe more in this post and connect with state assessments and the Common Core Standards in this post. The foldable and directions are below. As technology and schooling are continuously evolving, teachers must equip students with literacy skills needed to participate, engage, and succeed in our global and digital society. To do so, students must read, decode, and think critically, moving between printed texts and digital interactions for communication and producing information. Non-oral human communication has come a long way from cave drawings and cuneiform inscriptions. Communication in both the visual and written media continues to co-evolve. Writing has continued to permeate more than books, and students now find themselves reading more and more diverse texts and in more and more places – paper texts, online texts, informational text, literature, images and video on media platforms, game platforms, and social media. Whether the writing is in print or on screens, students are required to transfer reading skills to these different visual mediums for comprehension, communication, and creation. Transliteracy, coined by Sue Thomas, Professor of New Media at De Montfort University and the Transliteracy Research Group, “strives to set aside the typical ‘print versus digital’ dichotomy in favor of a more holistic integration of the ways in which we utilize various mediums to access information and make meaning. From pen and paper to moveable type to social networking, technology has changed the way in which we interact with one another and with information.” (Trimm, 2007) As a result, teachers are not just content area specialists but also literacy advocates, coaching students to be successful readers, writers, and critical thinkers. Teachers must continue to equip students with literacy skills needed to participate, engage, and succeed in our global and digital society. To do so, students must develop skills to read in print and online, decode these messages, and critically think about text and media. As Turner and Hicks point out in Connected Reading: Teaching Adolescent Readers in a Digital World (NCTE, 2015), “The process of ‘reading’ is complicated by many factors including experience, skills, motivation, interest the reader brings to the text, and the difficulty and reading level of the text itself.” Educators today are being called to teach reading that encompasses critical thinking skills. Pairing text and tech is one strategy that I use in my classroom to help students practice their critical reading and thinking skills. Below I share some of the text and tech sets I have used this year. I have implemented an article of the week with my 8th grade students. I adopted this reading strategy from Kelly Gallagher, to help my students practice reading and read a wider array of texts to build world knowledge. Students are to read a selected article each week and show evidence of their reading by marking up the text. After reading, students are to write a response to the article using our Google Classroom. The reading response is a multi-paragraphed reflection that shows his or her understanding of the text. To tackle the Common Core reading skills I have created a Think Tac Toe response activity to help scaffold how to respond to a text. Students are to complete THREE squares. They must complete a Tic-Tac-Toe, either horizontally, vertically, or diagonally. Students must go in a straight line; a student cannot just choose any three random squares. Students are practicing the Common Core reading skills, build prior knowledge and knowledge about the world. About eight years ago I had the opportunity to take a one day workshop with educator and author, Kelly Gallagher. It was write after he wrote Deeper Reading and since then, I have devoured every book (Readicide and Write Like Us) he has written. His writing resonates with so many ELA teachers and the classroom practices he offers throughout his texts are trustworthy and build literacy in rich and meaningful ways. 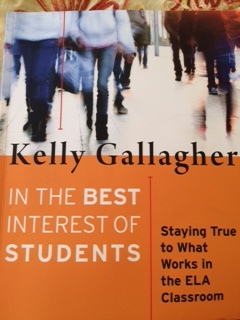 Gallagher’s newest book, In the Best Interest of Students: Staying True to What Works in ELA Classrooms (2015, Stenhouse Publishers) is no different. 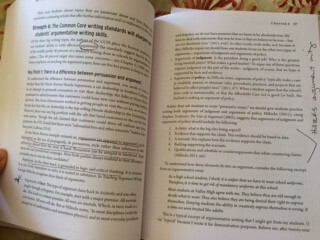 In this book Gallagher takes a closer look at the pros and cons of the Common Core Learning Standards specifically for reading and writing and offers 20-30 literacy building activities to support the readers and writers in our classroom. He reminds teachers, “teaching is not an exercise in checking items off a list of standards . . .good teaching is grounded in practices proven to sharpen our students’ literacy skills.” (Page 7) Here is a list of the good that has come out of the Common Core and where the Common Core learning standards are lacking. Essential reading skills include answering – What does the text say? What does the text do? What does the text mean? Students must read like writers – examine techniques used by the writer, the writer’s “moves,” and what makes something an effective piece of writing. Reading and writing is recognized as interconnected. Recognize audience and purpose to clearly decipher the text’s meaning. Writing is seen as a process and narrative, informative, and argumentative writing are valued the most. Students need to collect data, research, and see lots of models to write well. Speaking and Listening are key skills students need to be working on always. Connections – Nowhere in the standards does it address making connections – text to self, text to text, or text to world connections. Students need to apply what they are reading to their understanding of the world. Scaffolding – Students need to wrestle with the text but not at the expense of them losing interest and or getting lost. Students need important background knowledge and essential questions to frame their reading. Reading for pleasure is nonexistent. There is nothing written about how much a student should read and the breakdown of how much informational text versus literary text to be read is not equally distributed. Argumentative writing is overvalued and narrative writing is undervalued. Students need to be able to write in other formats and go beyond the five paragraph essay. As the state tests loom over so many teacher’s evaluations theses days we need to remember that we are not teaching to a test, but we are teaching young people. Our classroom activities should help students build their reading and writing muscles in order to help them succeed throughout their schooling and life outside of school. Gallagher’s book gives a wealth of ideas to support the good and add the skills needed based on what’s missing within the ELA CCLS. Here are a few of the strategies I will be trying out with my students this month. 17 Word Summaries – Before teachers have students peel back the layers of a text, students must be able to decipher what the text says and clearly articulate their “literal understanding” of the text. Gallagher chooses one student to pick a number between ten and twenty and based on that number, all the students must write a summary using only the number of words the student decides. This requires students to think about writing a lot in a short amount of words for everyone to understand. Analyzing Photographs to recognize Audience and Purpose. Gallagher asks his students to read photographs. First students share what they see (literal understanding) and then he gives some background about this photographer and what was going on in history the time the photo was taken place to then ask, “What was the purpose for sharing this photo?” Lastly, he asks, who did the photographer hope to see his or her photo? (Page 44) Gallagher talks through this activity using Dorothea Lange’s Migrant Mother. 6 Things You Should Know About . . . & Other Writing Activities to practice more informative writing. Modelled from ESPN Magazine’s “Six Things You Should Know About . . .” students write their own. Blending Story & Argument Together. A personal experience can strengthen an argument and Gallagher models how to weave a narrative into an argument paper through think alouds, LOTS of modeling, and text exemplars. Students collect data and then write their papers blending narrative into the paper to increase the effectiveness of the argument. Writing Groups to Develop Young Writers. Gallagher has his students meet in writing groups once a week. The writing groups includes five students of mixed writing abilities. Each week students bring a piece of writing (new draft or old piece that has been significantly revised) to share with their writing group. Each group member gets a copy of the writing piece to read and respond to. The group members have to “bless,” “address,” or “press” the writing marking up the draft that has been shared and write comments to the writer on note cards based on things marked up on the writing. The group members share their thinking aloud with the group while the writer listens. Close reading is one of the buzz words that is being emphasized with the Common Core Learning Standards. By close reading I am interpreting as the reading, rereading, and analysis of text for the purpose to understand it more deeply. Close reading doesn’t happen on every page of a text nor is it something that students should be doing with every text they read for school. Rather, close reading happens with particular passages to help students look more closely at specific elements of the text like theme, characterization, and word choice in order to gain an understanding of the complexities of a text. One of my goals with my eighth graders is to get them to read closely and thoughtfully on their own. 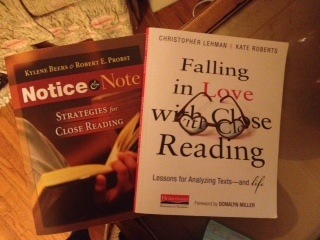 I recently read Kylene Beers and Robert Probst’s Notice & Note: Strategies for Close Reading (2013) along with Christopher Lehman & Kate Rober’s Falling in Love with Close Reading: Lessons for Analyzing Texts and Life (2014). These are two wonderful books that offer lots of insight into close reading habits for any classroom. 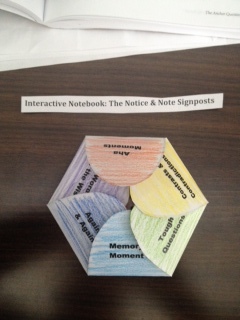 I have created an interactive foldable for my students with the six “notice and note signposts” described in Beers & Probst’s book. 1. Contrasts and Contradictions – Why would the character act (feel) this way? When authors show the reader a character acting in a way that contrasts with how one might expect someone to act or contradicts how that character has been acting, the author is showing the reader something important. 2. Aha Moments – How might this change things? When a character realizes or finally understands something, then the reader wants to pause because the realization means something. It could be related to character development or a new direction in the plot. 3. Tough Questions – What does this question make me wonder about? When a character pauses to ask him or herself or a friend some really tough questions, then the reader is getting a glimpse of what’s bothering him or her. This might be something the character is struggling with throughout the story. 4. Words of the Wiser – What’s the life lesson and how might it affect the character? When a wise character shares his or her understanding, insight, or advise on an issue or topic, stop and think about that. These insights could reveal something important about the theme. 5. Again and Again – Why might the author bring this up again and again? Repetition is important. It gives insight into the setting or character or could even be a symbol of some sort. 6. Memory Moment – Why might this memory be important? Memories of the past help to explain the present moment. A memory can give insight into what bothers or motivates the character, it can help to understand something happening in the plot, or give information about the theme. I could teach these signposts one at a time, but I felt it necessary to give my students all the signposts together to help them label and identify them as we begin to read Harper Lee’s To Kill a Mockingbird. Throughout our class discussions of the text I will point out examples of the sign posts to help guide students’ close reading so they might have a new understanding about. Lehman and Roberts write in their book, “Authors thoughtfully select details, hoping that we, the readers, are listening. When we take the time to do so, as carefully as we listen to the people we love, we see the complexity of ideas that reach beyond the page and impact our lives.” (p. 9) I want my students to be good listeners as they are reading a text. When listening to a text students are gathering evidence and reflecting on what new information the evidence reveals about the text. Close reading habits help students to develop a clearer understanding of a text they read in school but a clearer understanding of the world they inhabit. 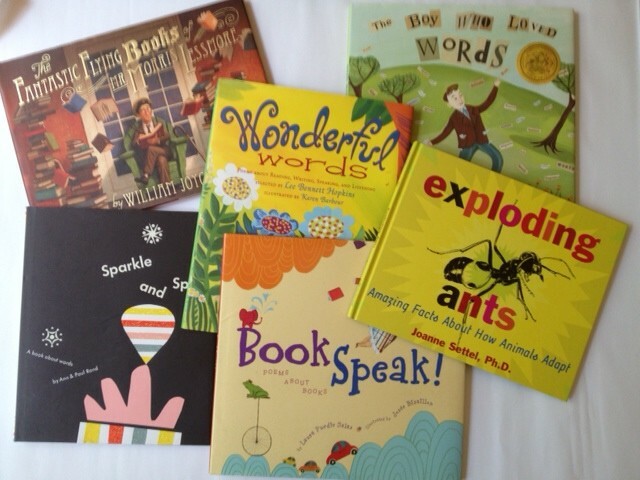 Read alouds enable the teacher to stop and talk to students about the process and ideas about reading. During the read aloud, a teacher reads aloud to students in order to model and demonstrate strategies that characterize proficient reading. The read aloud is also a time when students receive instruction that helps them talk well about books. Thus, in addition to modeling the work of proficient, fluent, and engaged readers during the read aloud time, the teacher also teaches students how to have accountable conversations about books. Here is some examples of dialogue a teacher can use to help model for students active reading and support students’ understanding of the text. “What is this book really about?” — Turn and talk to the person next to you. When teachers are reading aloud we want students to pay attention to the words, make connections, visualize, infer what the author is not saying, ask questions, make predictions, build vocabulary, and draw conclusions. Reading aloud help model for our students these reading habits so they can apply them when they are reading independently.